A damp pitch greeted the Mavericks for an 8am start at the India Association Cricket Ground. Boosted by the return of Anshuman Priorat, there was a renewed edge to the Mavericks pre-game demeanour. This was a team that refused to be intimidated by an opposition whose pre-game warm-up didn’t consist of phoning members of their team who still hadn’t turned up 5 minutes before the game was due to start. The toss was lost by skipper Aditya Madhavan but it was a good toss to lose. A damp outfield was surely going to slow the ball and prevent the flow of runs; so it proved. A very tight opening spell of bowling by lead strike bowler Kapil Tuli and Ansuman meant the game was still in the balance at 82-0 after 17 overs despite the opposition not having lost a wicket. This is the Mavericks though – the less said about dropped catches during those first 17 overs the better. Zero dollars raised for charity. Post drinks however, the Mavericks stormed into life with their best spell of the match. 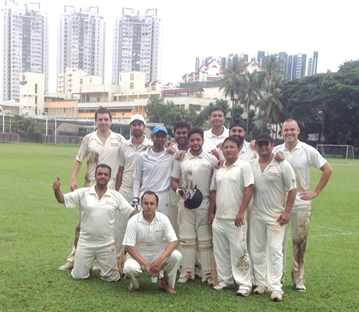 Persistence paid off for Anshuman as he took out the opener’s leg stump…first dollars in the bank. 2 overs later Kapil Tuli removed the other opener (caught and bowled) and when Anshuman trapped the #4 cheaply in the next, the Mavericks smelt blood. What followed will surely go down as one of the greatest moments in cricketing, and MediaCom, history. The clear remaining danger was IBM #3 Murund Asuri who’d effortlessly cruised to 21 off 18 balls and was threating to open up. His bravado however stretched to testing Chris Myers agility and arm at long-on. A floating ball dropped just short of Myers, Asuri opted to try for the second run, Myers flew in from the boundary picking up the ball in one fluid motion with the grace, yet deceptive power, of a prima ballerina then, calculating at the speed of IBM’s own Watson super computer, threw the ball a prodigious distance over the non-strikers end straight into wicket keeper Surendra Chebrolu ’s gloves who promptly took off the bails. Out! Out! Out! One can only imagine the immeasurable drain this unfathomable moment of brilliance must have taken out of Myers’ body which surely explains why he went down crying like a baby 2 overs later with a pulled Hamstring and was forced to bat #11. Kamal Oberoi took one more wicket leaving the visitors finishing on 171-5 off 30 overs. A good score but not an insurmountable one. Most importantly - $293 dollars raised . Samosas and chai consumed, openers Aditya Madhavan and Surendra Chebrolu took to the field to lead MediaCom’s response with the bat. A solid start was made, most notable for the performance of Surendra who moments after being struck on the cheekbone by a vicious delivery, hooked a head height delivery from the quicker bowler at the other end for 6. With each run worth $3.60, this one shot was worth $21.60. When Aditya was unluckily out to an unpredictable rising ball, hope still remained with talent still to come. Matt Wigham looked good before being stumped as did Kishan Khatri who departed after a couple of lusty blows that kept the scorecard moving. Mavericks wickets were continuing to fall however and when Kamal Oberoi, fresh from a rapid 40 the week before, departed in the 16th over, the Mavericks were no longer playing to win the game but to get what they could for charity. The hero of the day with the bat was clearly Surendra who top-scored with a brave 32. Your innings was worth $115. Well done. The Mavericks tail did wag however with some double figures contributions from Tirth Mann (10) and Shreeniwas Iyer (13*). The game ended with the debacle of Myers limping to the crease to share an unbroken 5 run partnership with Shreeniwas that basically consisted of hopping, falling over, and the opposition looking embarrassed. The Mavericks closed on 116-9 - $418 dollars raised. We lost the game by 55 runs. Including side bets, the grand total raised was $730. On behalf of all the Mavericks, I’d like to express our apologies for not only failing to win the game but also for not being able to squeeze out even one more run or wicket. Of course we could have played better, but we did our best. Through the highs and the lows, it was an honour to stand by my team mates representing our company, playing the game we love, doing our small part for charity. Our search for a victory continues. Thank you so much to everyone who contributed. I will leave a box at MediaCom reception from 9-5 every day for you to put your donation into. I’ll leave it there for the next two weeks. I have no right to ask, but if anyone wants to put any additional money in the box beyond what you committed to pay, please feel free. Once all donations are collected, I will make the total donation through Singapore Gives website letting you know the final amount. On behalf of the MediaCom Mavericks, Thank you once more!